When I started blogging back in June, my goal was to post something at least twice a week...well, it's been a week since my last post so I'm a little behind and here's my reason for it...I've become completely obsessed with sewing! I mean obsessed. I think about it at work, I think about it when I'm having dinner, I think about it when I'm hanging out with friends. I work it into conversations. It's gotten so bad that I'll get a faraway look in my eyes and Mr. H will ask "What are you thinking about?" and I'll say, "Nothing" and he'll say, "Oh you're thinking about sewing again, aren't you?". So whenever I get free time, I'm at the fabric store, behind the sewing machine, or on the internet looking for sewing inspirations. That's where I found my current sewing obsession...baby bonnets! Look at that bonnet. How cute is that? I found it on www.sewmamasew.com and had to try it. My good friend Jamie is expecting a baby girl, well, she actually had her two days ago. Guess who gets to be my guinea pig for my first bonnet, baby Gianna! I used some of the fabric I had left over from the quilt I made for her. There were two tricky parts. 1) The materials that were needed included picot edge double-fold bias binding which I could not find in any store so I made my own! I bought pink double folded bias binding and lace trim and sewed them together. 2) Making the spaghetti bias binding for the adjustable closure in the back took me an hour, literally an hour, to do. It's almost impossible to turn such a skinny strip of fabric in on itself. I found a method that finally worked on craftyendeavors.blogspot.com. It involved cutting a tab and then using a bobby pin to pull one end of the strap in on itself. 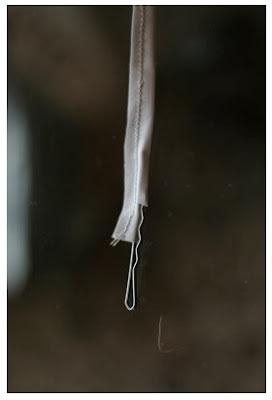 It sounds easy until a seam rips or the tab rips off the bobby pin. It took several ruined strips for me to get this done but it finally worked! Here is the bonnet for Gianna. It's reversible! 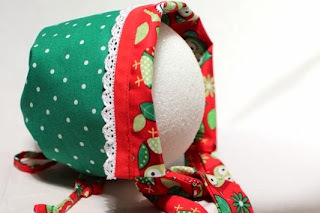 I also decided to make a Christmas bonnet since it's just two months away! It's reversible too! I'm putting this one in my Etsy shop. I'm so excited to make more! Oh how precious, Khammany! I love the fabrics and design. You are doing fabulously well developing your sewing skills! I'd be obsessed with it too if I had that kind of talent! Hope you are well. Precious, precious, precious! That is adorable! Look forward to seeing more of your projects! 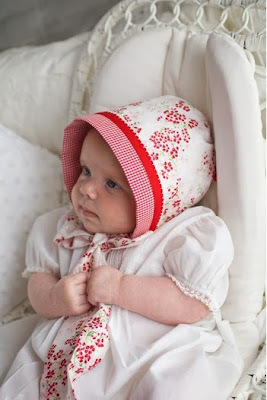 So sweet, and I love that you made the bonnet reversible. A lot of fiddly work, but a beautiful end result. You are doing such a fantastic job with your sewing projects-I love them all! 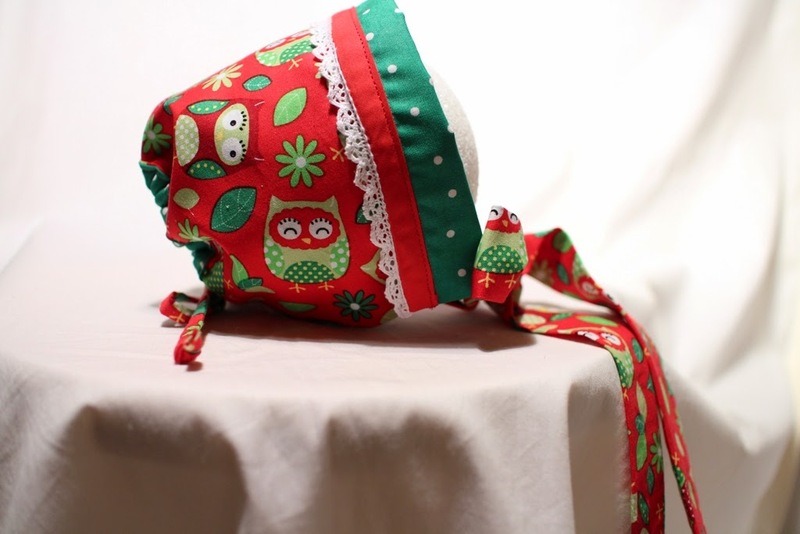 That Christmas bonnet is fun, festive and fit for a Christmas cutie! Very very cute! Lovely fabric choices too. Your bonnets are adorable!! Lucky baby who gets to wear them. The bonnets are so very sweet. Your fabric choices are really nice. I love the Christmas bonnet. I remember many years ago (like 50 or so) when I bought my first sewing machine from Sears. I was obsessed with sewing forever it seemed and one day I discovered miniatures. Off I went into another obsession. Later it became ceramics, and so on and so forth. It really is fun to be a crafter. What a fabulous obsession, and one that you are clearly meant for. Your work is beautiful! These are absolutely adorable! wish I had a baby to give this too!!! You will become a brilliant sewist in no time, clearly have a gift for sewing. The bonnets are just beautiful, and I really love your talent for combining fabrics. Lucky recipients of these adorable gifts. Oh my gosh these are darling!!! I love that they are reversible too! Super duper cute!! They are so cute. The Christmas bonnet is adorable. And I can't believe you actually get two bonnets for one since they are reversible. oh my, the bonnets are beautiful and how precious! Adorable, Adorable, the caps and fabric are so sweet. I think you are past a beginner quilter. I will always be a beginner because I don't have patience. Thank you for stopping by, I pass Denver when I visit my sister in Vail. Aaahhh, this bonnet is too cute. And baby looks adorable. My mom used to sew and would make all my clothes growing up. It is such a talent, you know?